Excel spreadsheet tools such as Goal Seek that change a single variable are useful, but unfortunately most problems in business are not so easy. You’ll usually face formulas with at least two and sometimes dozens of variables. Often, a problem will have more than one solution, and your challenge will be using Excel to find the optimal solution (that is, the one that maximizes profit, or minimizes costs, or matches other criteria). For these bigger challenges, you need a more muscular tool. Excel has just the answer: Solver. Excel Solver is a sophisticated optimization program that enables you to find the solutions to complex problems that would otherwise require high-level mathematical analysis. Solver, like Goal Seek, uses an iterative method to perform its calculations. Using iteration means that Excel Solver tries a solution, analyzes the results, tries another solution, and so on. However, this cyclic iteration isn’t just guesswork on Solver’s part. That would be silly. No, Excel Solver examines how the results change with each new iteration and, through some sophisticated mathematical processes (which, thankfully, happen way in the background and can be ignored), can usually tell in what direction it should head for the solution. Excel Solver enables you to specify multiple adjustable cells. You can use up to 200 adjustable cells in all. Excel Solver enables you to set up constraints on the adjustable cells. For example, you can tell Solver to find a solution that not only maximizes profit, but also satisfies certain conditions, such as achieving a gross margin between 20 and 30 percent, or keeping expenses less than $100,000. These conditions are said to be constraints on the solution. Excel Solver seeks not only a desired result (the “goal” in Goal Seek) but also the optimal one. For example, looking for an optimal result might mean that you can find a solution that’s the maximum or minimum possible. For complex problems, Solver can generate multiple solutions. You can then save these different solutions under different scenarios. When should you use Excel Solver? They have a single objective cell (also called the target cell) that contains a formula you want to maximize, minimize, or set to a specific value. This formula could be a calculation such as total transportation expenses or net profit. The objective cell formula contains references to one or more variable cells (also called unknowns or changing cells). Solver adjusts these cells to find the optimal solution for the objective cell formula. These variable cells might include items such as units sold, shipping costs, or advertising expenses. Optionally, there are one or more constraint cells that must satisfy certain criteria. For example, you might require that advertising be less than 10 percent of total expenses, or that the discount to customers be an amount between 40 and 60 percent. For example, the image below shows a worksheet data model that’s all set up for Excel Solver. 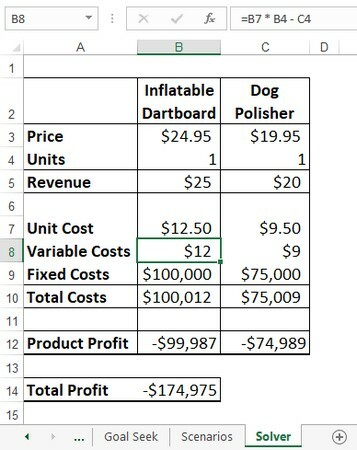 The model shows revenue (price times units sold) and costs for two products, the profit produced by each products, and the total profit. The question to be answered here is this: How many units of each product must be sold to get a total profit of $0? This is known in business as a break-even analysis. The goal for this data model is to find the break-even point (where total profit is $0). The objective cell is C14; the total profit and the target solution for this formula is 0 (that is, the break-even point). The changing cells are B4 and C4, which hold the number of units sold for each product. For constraints, you might want to add that both the product profit cells (B12 and C12) should also be 0. An add-in is software that adds one or more features to Excel. Installing add-ins gives you additional Excel features that aren’t available in the Ribbon by default. Bundled add-in software is included with Excel but isn’t automatically installed when you install Excel. Several add-ins come standard with Excel, including Solver, which enables you to solve optimization problems. You install the bundled add-ins by using the Excel Options dialog box; you can find them in the Add-Ins section. After they’re installed, add-ins are available right away. They usually appear on a tab related to their function. For example, Solver appears on the Data tab. In the Manage list, select Excel Add-Ins and then select Go. Excel displays the Add-Ins dialog box. Excel adds a Solver button to the Data tab’s Analyze group. Take a look to find out how to use the Excel Solver.